What once had the magical makings of a Halloween trick-or-treat parade for adults—gliding from stand to stand, being greeted with warm smiles and oftentimes intriguing demonstrations, and collecting an endless array of edible goodies—has now morphed into a tightfisted affair where close to nothing can be sampled and the name of the game is retail swindling. Swindling, you say? Swindling, I dare say. But wait, I’m getting ahead of myself. Let’s back up a little bit, which if you’re driving to the fair will prove nearly impossible. Just getting to the pavilion where it’s all housed is an expedition in its own right. At the moment, Biel resembles a vast minefield with huge tractors and trucks hauling boulders, rocks and uprooted concrete. The labyrinthine path blazed to the pavilion is stricken with protruding manholes and dirt everywhere. Even if you elect to park in the lot at the entrance to Biel and hop on the “free shuttle,” plan to slither your way around the Biel maze at slug speeds of 1 mile per hour tops. For those souls who brave their way to the main door, the entrance fee is 10,000 LL. Fair enough, weed out the riffraff and freeloaders. But what you don’t realize is that you just paid admission to enter a mall food court. Hardly anything is offered inside! I trekked from stand to stand, listening intently to what the vendor had to say about her extraordinary (not) product, and its versatile (not) uses. You put in the time, but there’s no remote semblance of a reward at the end, only items for purchase. Don’t they know the basics of sales and marketing? 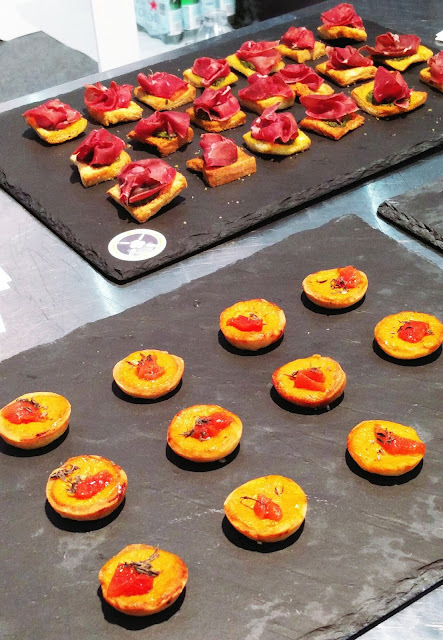 Lure customers in with bait—free nibbles—and once you wow them, seal the deal. Nope—these misers want to have your cake and eat it, too. One happy exception was ChefXchange, whose collaborating chef Farid Chehab of Kitchen Central wielded delicious epicurean canapés as well as live cooking to attract aimless wanderers. 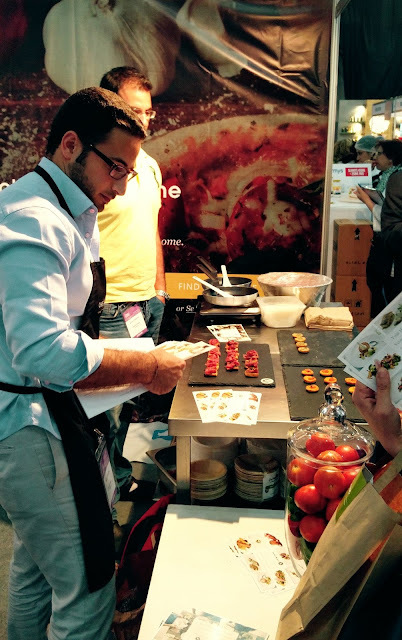 Given that ChefXchange is a foreign startup run by savvy international entrepreneurs, they understand the canons of PR and marketing and weren’t looking to generate their year’s bottom line at the Beirut Cooking Festival, as other stands had hoped. Next to them, too, Jaber Jaber & Sons hailing from the Bekaa Valley boasted about a dozen various cheeses and strained yogurt for open tasting. They were the second anomaly in a sea of scrooges. It seems East Lebanon alone still has a firm handle on Lebanese hospitality. I’d been preparing myself mentally and physically for a criminal overload of chocolate and other sweet treats, but I actually left with a bittersweet taste of dissatisfaction. That and of an amorphous stale cookie suspiciously offered to me—the fresh-baked batch had a price tag. Sheesh. One ice cream maker advertised a cup of their frozen novelty for a whopping 12,000 LL! Who would pay 22,000 LL, between festival entry fee and product, for a couple licks of sweet ice? The crowds were unsurprisingly congregated around the fast food stands—the unfailing Em Ali, Abul 3ezz Grill, El Gringo Tex-Mex, l’Os and others. Well, no duh, where else could you fill your paunch? You pay, you eat. That’s what this fair despicably comes down to. I learned my lesson (and it seems I'm not alone! Shout-out to Beyond Beirut's wonderful post). Next year, if by some unforeseen phenomenon I am dragged back (with legs kicking) to this food swap meet, I’m bringing my own pantry in tote. And let it be known: I’ll be happy to share with curious onlookers, free of charge. Damn. I had to pay to comment here. I haven't been to this festival for the past couple of years. Which means I've only been there 3 years ago. I intended to visit with no hopes or expectations because I knew that there wouldn't be any notable change. As a food blogger who us curious about recipes, prep methods, and ingredients, I was very disappointed. The festival was a housewives gathering and brand exposition than it actually featuring food as a star. I would say the same about Horeca to be honest. I'm glad I didn't go and waste my time and money. I was gaining kitchen experience and earning some money at the time. Thank you for attending our Beirut Cooking Festival and Salon du Chocolat. We are sorry to hear you didn’t enjoy your experience. We would love to hear your ideas so please send your contact details to lisa@hospitalityservices.com.lb.